In 2015, after a rigorous review by the FDA, DigniCap was the first scalp cooling system to receive clearance in the United States. It was concluded that the DigniCap Scalp Cooling System prevented hair loss in 66.3% of patients with breast cancer receiving adjuvant chemotherapy, compared to a control group where all patients experienced significant hair loss. Scalp cooling treatment was well-tolerated and no scalp metastases have been observed. Rugo, H; Klein, P; Melin, S; et al. Principal Investigator Hope S. Rugo, M.D. Principal Investigator Susan Melin, M.D. Principal Investigator Tessa Cigler, M.D. Principal Investigator Paula Klein, M.D. Principal Investigator Sara Hurvitz, M.D. A clinical study comparing hair loss in 117 breast cancer patients who used and did not use The DigniCap Scalp Cooling System was performed. All patients had either Stage I or Stage II breast cancer and underwent at least four cycles of specific chemotherapy regimens. Sixteen of these women did not use the scalp cooling system and 101 patients used scalp cooling. The average age of the women was 53.0 years (range 28-77); 77.4% were White, 10.4% were Black and 9.4% Asian. 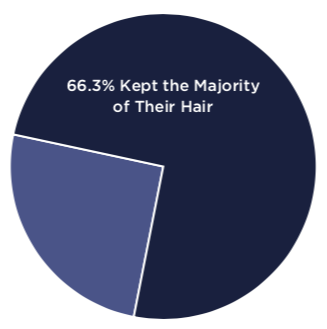 At one month after the last chemotherapy treatment, almost half of the women who had used The DigniCap Scalp Cooling System reported that they never used a wig, cap, scarf or other head cover due to hair loss. Patients in the study filled out an Alopecia Self-Report questionnaire. Results clearly showed that 101 patients who had an average of 3.6 cycles of chemotherapy and used The DigniCap Scalp Cooling System were satisfied with the decision to use scalp cooling and expressed higher satisfaction with their hair quantity and hair quality as compared to controls. In contrast, the 16 patients in the control group had an average of 1.5 cycles before discontinuing reporting due to hair loss. Patients reported a satisfaction score (0 to 100) of 25.6 for hair quantity, and a mean score of 37.6 satisfaction with hair quality. Alopecia Self-Report results indicated 0.9 cycles with no significant change in hair texture. Six women reported seven adverse reactions caused by The DigniCap Scalp Cooling System. These were headache (four women), itchiness (one woman), pain of skin (one woman) and head discomfort (one woman). None of these reactions were rated severe and one headache was the only reaction rated moderately severe and the rest were mild. 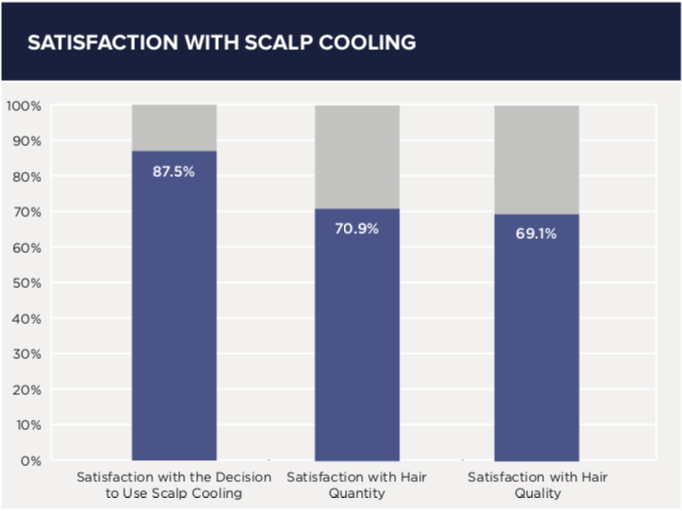 Three of 106 women discontinued use of scalp cooling because of cold discomfort, while 102 out of 106 women had a feeling of chilliness during the cooling down period. Less than half of the women (43/106) reported that headaches were triggered or exacerbated by scalp cooling. Although headaches occurred, they were not reported at every cycle of scalp cooling. 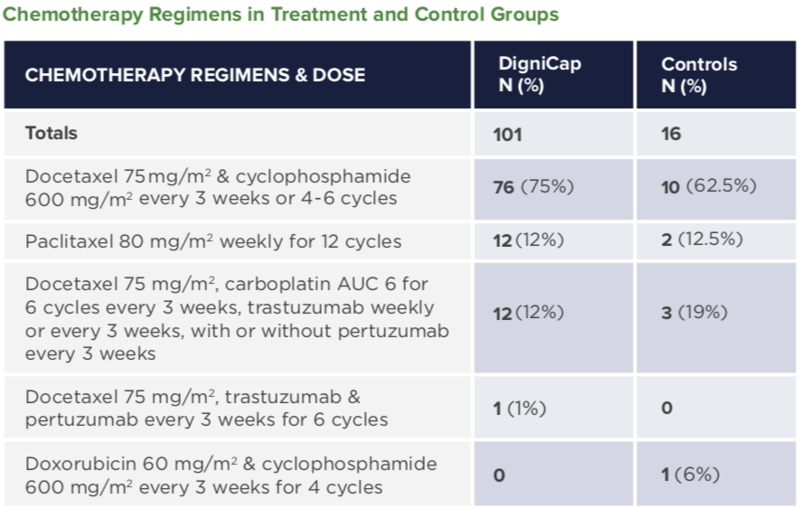 The DigniCap System is highly effective in reducing chemotherapy-induced alopecia with clinically meaningful benefit. The DigniCap System prevented hair loss in 66.3% of patients with breast cancer receiving neo/ adjuvant chemotherapy, compared to the control where all patients experienced significant hair loss. Treatment was safe and well tolerated. To download a copy of the Long-term Safety Follow-Up CLICK HERE. You are now visiting the DigniCap US product website. If you are located outside of the United States, CLICK HERE to visit our Global website. For company and investor information, CLICK HERE for our corporate website.